As Hurricane Matthew fades over the Atlantic Ocean, several nations face the daunting task of recovery from yet another devastating storm. The loss of life is heartbreaking—the death toll in Haiti, still reeling from the 2010 earthquake and the subsequent and persistent cholera epidemic, has soared past 1000. Hundreds of thousands are in need of immediate humanitarian aid as many communities remain cut off from the outside world. As of this writing, 34 deaths have been reported in the United States, four in the Dominican Republic, and one in St. Vincent and the Grenadines. In Cuba the hurricane ravaged the island’s eastern tip and caused extensive damage to the city of Baracoa, yet the storm passed without inflicting casualties. That this impoverished island nation was able to withstand the Category 4 storm without loss of life is remarkable, but it was not a miracle or simple luck. Over the past several decades Cubans have developed what is possibly the world’s most comprehensive model for national disaster preparedness and response. This past week, one million Cubans—nearly 10 percent of the nation’s entire population—were evacuated from areas threatened by the storm, according to Cubavision, the country’s national broadcaster. The level of coordination and efficiency to mount such an effort is extraordinary and testament to the resiliency of the Cuban social model. 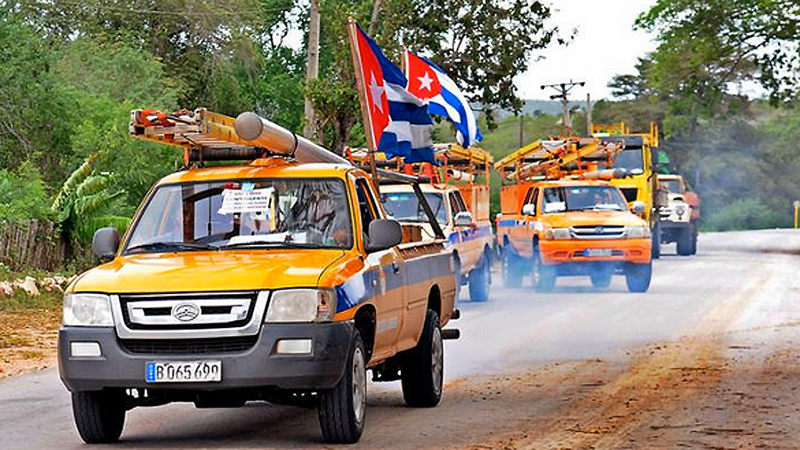 When a hurricane approaches Cuba, it sets into motion a carefully-planned and well-rehearsed effort to marshal the nation’s resources to protect lives. At the national level, the Cuban Civil Defense authority broadcasts across all media to inform the public about a looming threat. State-owned buses, trucks, and other vehicles are deployed to help evacuate flood-prone areas, and centers are set up to provide shelter, food, and medical attention for those who need it. At the local level, evacuations are organized down to individual streets, where block captains ensure that the most vulnerable people, including the elderly and disabled, children, and pregnant women are moved to safety. Before the start of each hurricane season, Committees of the Defense of the Revolution (CDRs) in every neighborhood are responsible for reviewing and updating their evacuation plans. Perhaps Cuba’s biggest asset is its well-informed citizenry. Compliance with evacuation orders is near-universal because the country conducts extensive education and simulation drills, beginning at an early age as part of school curriculum and continuing at the community level. This model of community planning and teamwork sits in stark contrast to the erratic, go-it-alone approach that largely characterizes the US response to natural disasters. As we’ve witnessed with Hurricane Matthew, American families are warned to evacuate but given little to no assistance or direction in actually doing so. Those who can afford it fill up their gas tanks and rush to crowded highways or airports. Those who have no place to go or no money to get there are left behind to fend for themselves. When a particularly deadly hurricane makes landfall and casualties mount, it is often the victims themselves who are blamed for their fate—as we saw during Katrina when 1,836 people, disproportionately elderly and poor, lost their lives. What is the ultimate difference between these two models? Americans are 15 times more likely than Cubans to die in a hurricane, according to the public policy think-tank Center for International Policy. In places like Haiti, where there is neither a public system to facilitate an organized evacuation, nor a national transportation infrastructure able to accommodate a haphazard one, the results are often catastrophic. Cuba’s extraordinary system of disaster preparedness reflects in many ways the broader achievements the island has recorded in the realms of public health, education, and social solidarity. Despite Cuba’s poverty, its ailing infrastructure, and an economic blockade that has cut the nation off from its most natural trading partner for the better part of a century, Cubans continue to find ways to innovate, to persevere, and to take care of each other. Brynley A. Lloyd is a trade union activist and writer. He holds a Master’s Degree in Global Politics from the London School of Economics and Political Science.